Year long advertising. That's what long term promotional gifts need to provide. Apart from promotional calendars (of which there are many different variations), Business Diaries are hugely appreciated in the workplace. We have ranges from day to a page, and week to view diaries which can provide a fantastic year long and personal gift for your customers to remember you by. 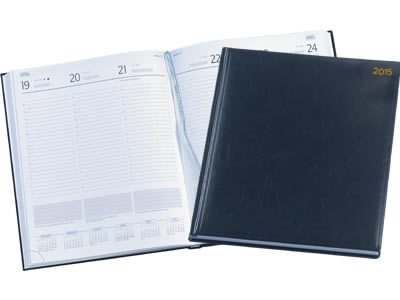 A promotional diary is quite personal for a business gift. It's direct, you can post it and you can hand it to the customer directly but a business gift like this provides that extra etiquette that you'd expect from a high quality business gift and these diaries absolutely scream high quality and are an absolute dream when organising your life and day to day events. Give a customer a gift like this and he'll think of your company every day! This kind of visual retention is absolutely invaluable in this economy, more than ever before. Help to keep your business advertised during these times of high competition by sending your friends, customers and competitors one of our Business Diaries. Simply decide which of our Business Diaries you like best and we'll see that they all reach you ready printed up with your business details and company logo. So whoever's desk it lies upon, it will always display your advert.